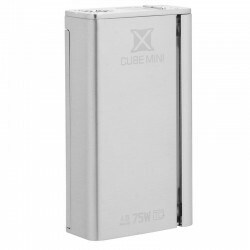 SMOK X CUBE MINI is the mini version of X CUBE II. As one of the most accurate temperature-control mods, X CUBE MINI features three new functions: Intelligent Coil Recognition, Adjustable Temperature Coefficient of Resistance and Adjustable Initial Resistance, which are designed to bring your vaping experience to the next level. It has 75W maximum outputBluetooth 4.0 technology, and a customizable LED that potentially illuminates in up to 16 million colors. And there many more functions are waiting for you to discover. Powered by single 18650 battery (NOT INCLUDED).